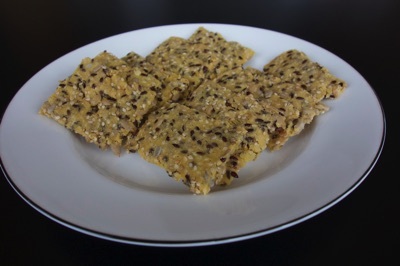 Mix together cornmeal, sunflower seeds, sesame seeds, linseeds, oil and salt. Add boiling water and stir. Spread the mixture evenly on a baking tray covered with baking paper. Cut in squares. Bake in oven 150 degrees for 1 to 1 1/2 hours. Dissove the yeast in the water and then add the flour, salt and seeds. Stir until everything is mixed properly. 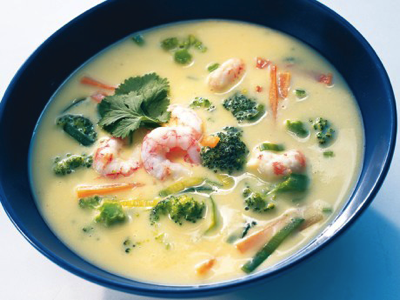 Cover the bowl with a lid or plastic wrap and let stand at room temperature for 8-10 hours. 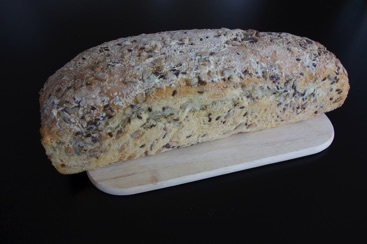 Grease a loaf pan and sprinkle sunflower seeds, linseeds and sesame seeds (about the same amounts as in the dough) on the worktop. Scoop the dough out on to the seeds, make it into a square and fold once so the new seeds end up on the outside. Place the dough into the loaf pan, cover with a towel and let rise for about 1 hour. Preheat the oven to 250 degrees well before the bread has finished to rise. Put the oven rack just below the middle and a baking plate on the bottom shelf. Put the loaf pan on the oven rack and a few ice cubes on the bottom plate. Lower the heat to 200 degrees after 15 minutes and bake the bread for an additional 20 minutes. Take out the bread from the loaf pan and let it cool on a rack. Wash and shred the leek. Peel the carrot and cut it into thin sticks. Rinse the broccoli and divide into small florets. Peel and chop the garlic. Heat the oil in a saucepan. Fry the vegetables while stirring for a few minutes. Add the soup. Bring to boil and simmer for about 5 minutes. 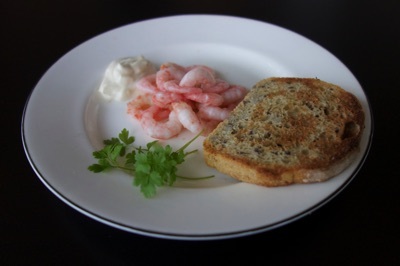 Add the coriander and shrimps, season to taste and serve with bread. Mix sourdough base, flour and water. cover with lid or plastic foil and let stand for 8-10 hours, preferably at temperature between 22-25 degrees. Mix the dough. 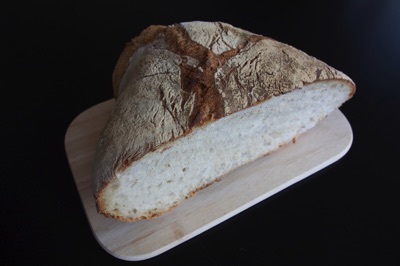 Mix the yeast and water in the sourdough from yeasterday and then add the remaining ingredients. Stir until everything is mixed well and let the dough rest for 45 minutes. Cover the bowl with a towel if it is drafty. Rest and fold. Dip your hand in water and then grab the edge of the dough with one hand Pull out the dough slightly and fold it towards the middle.Take a new grip, pull the dough and fold it towards the center again. Continue until you completed one round. This process is repeated in total three times with 45 minutes intervals. When the dough has been stretched the third and last time, let it rise for about an hour. Bake out the bread. Sprinkle plenty of flour, preferably mixed rye and wheat, on a baking towel. Carefully scrape the dough from the bowl, pull it into a square and fold the edges towards the center. Turn the dough so the seam is pointing downward. Fold the towel into a loose parcel and let rise for about an hour. Preheat the oven to 250 degrees well before the dough has finished to rise. Put one baking tray in the middle of the oven and one on the bottom shelf. Bake the bread. Turn the dough onto a piece of baking paper so the seam is up. Let the paper with the bread slide onto the hot plate by using a board or a tray and put a few ice cubes on the bottom plate. After 15 minutes, open the door and vent a little. Continue to air every five minutes until the bread has been in the oven 30 to 35 minutes. If the bread is getting to much colour, you can lower the temperature any time. Let the bread cool on a rack.